DESERVES TO BE CALLED A SAINT!" Everyone has heard of Joan of Arc but how many people really know the complete story about this famous person?� Perhaps it is the complexity of all that happened to her and the long, hard to read biographies that keep most people from knowing the full story.� Ben D. Kennedy solves this problem by delivering an easy to read yet compelling biography that covers the life of Joan of Arc in a way that is both beautiful and inspiring. The story of Joan of Arc is so remarkable that it is one that everyone should fully know.� Called by God to rescue her people from the invading English, she answers the call when she is only sixteen years old.� A little over two years later, she is dead but in the brief time she lived, she accomplished as much as anyone in history and became the legendary figure that she remains today. At first glance, you might wonder how a poem can cover such a story but Kennedy explains:� �I can say in a poem in a few lines what it would take pages to say in a regular biography and say it better.� In today�s World, few people have the time or the inclination to read a thousand page biography but Maid of Heaven can be read in less than an hour.�� The other advantages to the poetic form of writing become apparent as you read Maid of Heaven.� The sheer beauty of the easy flowing verse brings to the story a kind of Homeric heroism echoing classic epic poems of the past. Why did you write Maid of Heaven?� My dream, when I started writing Maid of Heaven, was to cover in a poem the life of Saint Joan in a way that would give the reader a sense of what I have learned after studying her life for years and reading literally tens of thousands of pages about her. In today's modern hectic society, most people have neither the time nor the inclination to devote to such study so I felt a poem was the only way to reach many people with this incredible story. It was a tremendous challenge that took over a year to write but I think that Maid of Heaven does succeed in covering the life of Saint Joan of Arc. What makes the story of Joan of Arc so incredible?� All that she was able to accomplish at such a young age is unparalleled in history.� Only 17 when she was put in command of the French army, she is the youngest person to ever command the armies of a nation.�� In only a couple of months she was able to completely reverse a war that had been going on for almost 100 years that the French were about to lose.� The victories she won at Orleans and Patay are considered among the greatest in all of history.� Add to all of this her prophetic ability that was always correct, her personal devotion to God and commitment to purity and it is a story that can only be described as incredible. Why is Joan of Arc still remembered so many years later?� Her military victories will always ensure her a place in history but I think she has become a hero to many people for much greater reasons.� Since she died, people have continued to look to her as a symbol of hope whenever freedom has been threatened.� In both WWI and WWII, the French rallied behind her name as a symbol of resistance to tyranny.� As freedom in our own times becomes more and more threatened I think you will see more people turning to her to learn how to fight. What are these spiritual truths that you have learned? There are many important lessons that can be learned from her life but there are two spiritual truths that I leaned from her that have made a great difference for me personally. God helps those who help themselves is something I was told was not true because these exact words are not in the Bible.� When Church scholars first examined Saint Joan, she was asked why she needed an army if God desired to deliver the French people.� I quoted her reply in Maid of Heaven because it is so simple and yet so profound:� �In Gods name, the soldiers will fight and He will grant victory.�� The priests examining her looked at each other amazed at her perfect response saying it was just that way in the story of David where David had the faith to go out and fight Goliath and trust God to give him victory.� I think this is a very important lesson for people to learn.� I am constantly hearing people say they are praying for our country, which is good, but it takes more than prayer.� Joan teaches us that we need to also take action and trust God to give us the victory. The other spiritual truth that has meant a lot to me relates to the first in that if we want to be blessed by God with victory then we should want to be completely on God�s side by eliminating the things in our lives that displease Him.� When Saint Joan first took command of the French army, she told them that if they wanted to be aided by God then they were going to have to become the army of God.� She ordered them to begin going to mass regularly and eliminate the usual carnal pursuits that have plagued all armies like profanity, gambling and prostitution.� This was no small order because the core of the French army consisted of mercenaries who considered such pursuits as much a part of soldiering as fighting.� Many of the leaders in the army later commented that it was a great miracle that the men and the officers did obey her and that the nature of the army completely changed.� What also completely changed was that after almost 100 years of losing the French army started winning. Are there others lessons to be learned from her life or is this just a story for Christians?� This is a story for everyone and I have already been amazed at the response I have received from a wide range of people.� We all face some of the same struggles she faced and would like to be able to handle them with the same courage and dignity in which she handled her struggles.� The lessons to be learned from her life can help anyone, which is why I think she inspires so many people. Why is her life so well documented?� The Catholic Church officially examined her life three different times.� First, before she was given command of the French army the King asked the Church to examine her.� For three weeks, they questioned her about herself and her motives.� The also sent their agents back to her village of Domremy for a report on her from the people who knew her best.� She was only 17 at the time but she was able to amaze the priests who examined her with her answers.� At the end of this examination, the Church proclaimed that they had tested her according to the requirements of scripture and affirmed her mission from God.� The written record of this examination was lost or destroyed but the testimony of the people involved in the examination remains to give historical evidence about why she did what she did. The second time her life was examined was when she was put on trial by the part of the Church controlled by the English.� To me this is some of the best historical evidence because this examination was conducted by her enemies who were trying to destroy her reputation before they killed her.� Fortunately for history, the head recorder refused to alter the record, even though he was threatened with death to change it, so we have an accurate record of what was said at her trial.� This trial record has proved invaluable to historians because it is extremely in-depth and touches on just about every aspect of her life. What about the quotes you include, are they also historically accurate?��� Most of them are the exact quotes that she was recorded as saying, translated, of course, into English.� There are a couple in Maid of Heaven that I had to paraphrase but even those I made as close as possible to what she actually did say.� I have always felt that one of the best ways to learn history is to read what people who were there actually said.� That way you are getting the history straight from the source.� The other part I like about using actual quotes is it allows the personality of the person to come through which gives you the best idea of who they really were.� In the case of Saint Joan, her quotes are simple amazing in terms of the wisdom they contain and the wonderful person that shines through as you read them. Do you really believe that she communicated with God�s Angels?� Actually, it was one angel, the archangel Michael, and two Saints, Margaret and Catherine who were both martyrs.� Yes, I do believe that she communicated with them because she said she did and so did the people closest to her.� I also think it is the only logical explanation to explain how she was able to accomplish all that she did.� Only God could take an uneducated country girl and turn her into one of the greatest military commanders in the history of the World.� This is my opinion, of course, but it becomes clear when you study the history that virtually everyone who lived during her time believed the same thing, including her enemies. Was Joan really in command of the Army, or was she just a figurehead as some have argued?� I do not know of any reputable historian who has tried to say such a thing because there is no historical evidence to back it up.� The actual quotes by the men who fought under her make it very clear that she was in supreme command of the French army.� The Duke of Alencon served as the highest-ranking commander under her and he also made it clear that she was the supreme commander.� Saint Joan actually commanded in a manner very similar to another great general I have spent many hours studying:� Robert E. Lee. �Both were brilliant strategists who allowed their subordinate commanders a great deal of discretion in how they conducted the fighting of the battle.� Saint Joan actually engaged in more hands on leadership than Lee since she personally led the charge on many occasions.� The bottom line on this comparison is that if you are going to say that Saint Joan was not in complete command then you might as well say the same thing about Lee; which would be ludicrous. What were her greatest military victories?� The battles of Orleans and Patay are considered among the greatest victories in the history of warfare.� Orleans was remarkable because it turned the tied of a war that had been going on for almost 100 years that the French were about to lose.� The city of Orleans was the last great city that the French held and it had been under siege by the English for almost 7 months and was about to fall.� Saint Joan went there and, in only three days of fighting, reclaimed the strongest fort the English possessed which caused them to lift their siege and retreat.� The battle has been compared to other key turning point battles like:� Marathon, Stalingrad, Gettysburg, Midway. Patay was remarkable because of the overwhelming margin of victory that she achieved in the battle.� The French suffered few losses while the English army was annihilated with losses in the thousands.� Patay is often compared with Agincourt and described as a mirror image, which is ironic since it was Agincourt that had pushed France to the edge of defeat necessitating the miracle that she provided.� Many of the renowned great generals in history never had so overwhelming a victory as Saint Joan had at Patay. Why was she defeated at Paris? It is hard enough to fight the enemy and win but when you also have to fight treacherous people that are supposed to be on your own side it becomes impossible.� This is what finally caught up with Saint Joan at Paris.� If Charles had allowed Saint Joan to immediately march upon Paris after his coronation then she would have easily captured the city.� But Charles was being influenced by corrupt advisors who were most likely paid off by the English or the Burgundians to keep Charles from being more aggressive.� I think by this point in time the English realized they could not beat her with military power alone so they started using political maneuvering to stop her.� Saint Joan still could have won at Paris if Charles had given her full support but for whatever reason he chose not to which doomed her at Paris. Did Charles betray her then?� He certainly did not show her the same loyalty that she showed to him.� The main thing to learn and remember about Charles is that he was very selfish and his foremost priority was always his own survival. Years later when his own son began to have military success Charles quickly removed him from command fearing he would become too popular.� I think it is his selfishness more than anything else that caused him to make bad decisions that resulted in the defeat at Paris and ultimately in the capture and execution of Saint Joan. How was she captured? She had predicted when she first started that she would only last about a year but I think she was hoping she would be killed in battle. She was told by her Voices several months before her capture that she would be captured but they did not tell her when or where.� She later said that if she had known the exact time she would not have gone into battle but she also said:� �Nevertheless I would have obeyed the command in the end, whatever the outcome.�� The way she submitted to God�s will here probably impresses me more than anything else she ever did.� She had to have incredible faith and courage knowing what she would most likely face in the hands of her enemies. So the English actually bought her?� The Duke of Bedford, who was the King of England�s uncle, and who was the real power behind the young King, paid the Burgundian lord whose forces captured her 10,000 francs to get her under English control.� As soon as she had been captured, Bedford began scheming with Church leaders loyal to the English to develop a way to put her on trial for witchcraft.� Bedford knew he could not just kill her but he also had to destroy the great reputation she had gained and he thought that killing her under the auspices of the Church would accomplish this.� How wrong he was. 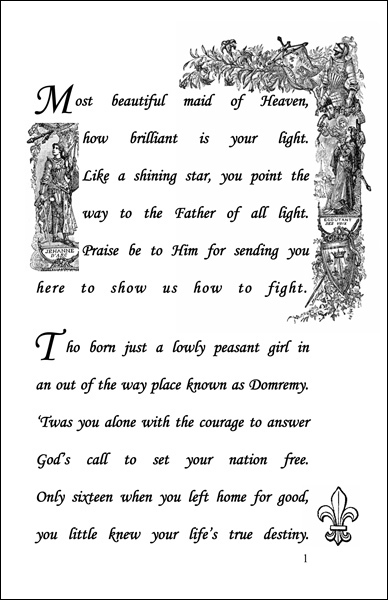 Why was Joan of Arc burned at the stake?� It was completely political and most reputable historians accurately refer to it as murder.� The English had been fighting the French for almost 100 years and were just about to win the War, which would have given them control of all of France.� Suddenly this young girl shows up saying she is sent from God and the War completely turns around.� The English leaders hated her and believed that if they could just get rid of her that could resume winning.� The Duke of Bedford, the overall English leader, made a deal with the part of the Church loyal to England to put her on trial for heresy so that it would ultimately look like the Church killed her instead of the English. How long did her trial last?� Including the preliminaries it was about 4 or 5 months during which she lived in a prison cell chained up and guarded by rough English soldiers.� The English put pressure on Cauchon, the bishop in charge of the trial, to speed things up but Cauchon wanted to create a legal basis for killing her, probably to protect himself with the Church.� The difficulty that he had in doing so is seen in the records from the trial.� I don�t think Cauchon expected her to do as well as she did in defending herself against his handpicked judges so he used every trick he could to concoct charges against her.� When this trial was overturned and nullified by the Church twenty years later it was Cauchon who was accused of heresy for his part and Saint Joan who was declared to be a martyr. When did Joan become a Saint?� She officially became a Saint of the Catholic Church in 1920 but I think almost all of the people who knew her looked at her as a Saint when she was alive.� When I wrote Maid of Heaven, I decided the most convincing proof of her saintliness came from those who were her enemies and who took part in her execution.� The recorded history contains the instances I refer to where her executioner and an English soldier both suffered great remorse for taking part because they said they had burned a saint.� The overwhelming consensus among the hostile crowd that witnessed the execution was also the same.� As I have said before, some of the most compelling historical evidence is when someone�s enemies say something positive about a person and Saint Joan�s enemies made it clear that they believed she was a Saint. Do you like any of the movies that have been made about Joan of Arc?� Most of the recent ones I have seen are not historically accurate.� Some are better than others.� The best I have seen from a historical standpoint is the classic film with Ingrid Bergman by Victor Fleming.� It is not perfect but it stays true to the story for the most part.� On the other hand, the recent movie The Messenger is horrible from a historical standpoint. I think The Messenger is an example of what happens when you try to explain the life of Saint Joan apart from God, which of course is the politically correct thing that moviemakers try to do these days.� It just cannot be done; at least not accurately, because, as I have referred to previously, the statements of those who knew her best said the only explanation for her great accomplishments had to be God. Why aren�t the movies more historically accurate since her life is, as you say, is so well documented? �We live in an age in America where there is a great effort to remove God from everything.� Because Saint Joan is such a hero to so many she can�t be ignored so I think the politically correct crowd has instead tried to change her history to suit their own agenda.� Ultimately, I think seeing all of the recent distortions is part of my motivation for writing Maid of Heaven so that people will be able to easily read a poem about Saint Joan and learn the truth. � Born about January 6, 1412. � Won her first military victory at Orleans on May 8, 1429. � Won her greatest victory at Patay on June 18, 1429. � Crowned Charles VII at Reims on July 17, 1429. � Captured at Compiegne on May 23 1430. � Executed May 30, 1431 in Rouen at the age of 19. � Officially canonized as a Saint in 1920 by Pope Benedict XV. � Is the youngest person in history to command the armies of a nation at only 17.